The first time I heard about Tracey Mallett was over 10 years ago in New York when Ivy was on Good Morning America and I was her food stylist. I have never actually met Tracey but I have heard so many great things through Ivy and I follow her on social media and love her workouts. I am a full-time working mom who just turned 41 and like most other working moms, I find it difficult to find the time to eat clean and workout on a regular basis. It all seems to be especially difficult as I get older and have more responsibilities and less extra energy. As a busy working mom who is also over 40, Tracey has made a career out of helping other women stay healthy and fit. Since Ivy is just launching her “Fit Over 40” workout video series, I thought it would be perfect timing to catch up with Tracey and see if she can share some of her healthy living and workout tips for all of us who are over 40! Tracey Mallett is an International Fitness and Wellness Expert, dancer, choreographer and Master Pilates Instructor who teaches around the world. She is very well known for her time crunched individual creation of the workout called The Booty Barre. Tracey makes it her mission to design workouts that are simple, quick and practical for busy women. Tracey has sold over one million units of her dance and fitness based DVDs. Some of the DVDs are The Booty Barre, Fuse Dance Cardio, Fit For Pregnancy and the two latest DVDs are Svelte U Workout One and Svelte U Workout Two . Tracey owns her own fitness and Pilates studio in Los Angeles, and certifies trainers all over the world in “The Booty Barre” technique. Tracey lives in Pasadena, California with her husband and their two children, Amber and Ty. Can you give me an example of what your workout looks like in a week? I certainly practice what I preach so I do “The Booty Barre” classes three times a week and run about four times a week for 30 minutes. But my true passion is Pilates. I love it! Do you feel it is harder to stay in shape after 40? Due to clean eating and knowing my body, I actually feel that it is easier for me to stay in shape after 40. At this age I definitely listen to my body more and do not push myself like I did when I was younger. If I am tired or sore I will do a lighter workout. I have learned to not be so critical of myself and to really pay attention to the quality of food that I put in my body. What you put in your mouth is just as important as working out. I truly believe that you are what you eat. Do you see any changes in your body since you turned 40? I am actually leaner in my 40’s than I was in my younger years. But I attribute that to my emphasis on nutrition and clean eating as well as learning how to exercise smarter. I have always had to work extra hard on my booty though because it tends to drop faster and my fat settles there. I have always been extra conscious of that area. However, I find that when it comes to staying in shape, consistency is key. What I have learned over the years is that I don’t need to go to extremes, I just need to stay consistent with eating clean and working out to stay in shape. Any tips for someone who is just starting to workout? Start easy and be realistic! You cannot go from nothing to working out 5 times a week, especially as you get older. Build up your workouts gradually and don’t burn yourself out. Your body will definitely be sore and not used to it so start SLOW. Can you give an example of what you eat in a typical day? Breakfast: Omelette with veggies or gluten free oatmeal with berries. Morning Break: Clean energy bars such as The Perfect Bar or LaraBars, fruit and nuts. I was born in the UK so of course I am a big tea drinker. I know most people start their day with a cup of coffee, but for me it’s tea! English Breakfast Tea by Twinning Tea is my favorite …. I LOVE IT and don’t go a day without this tea. Do you see a big difference in your body, mood or health from your 20s, 30s and now your 40s? I feel the older I have become the more emotional I am. I also really feel the desire to help so many people. The biggest advice I can give anyone is to start working out and eat clean whether you are 30 or 60. It is never too late to start taking care of yourself. You only have one body so take care of it and you will be much happier. Tracey takes Green Vibrance every day!!! Anything you take or do every day since you turned 40? 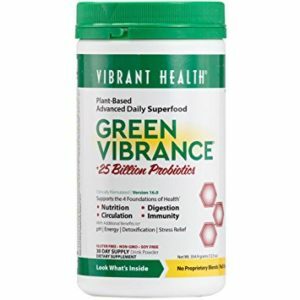 I take a good multivitamin everyday and I have a least one green drink a day like Green Vibrance. I also take Juice Plus+ (a whole food based fruit and vegetable supplement) and I make a real effort to eat a lot of vegetables, salads and nuts. I make a conscious effort to do this every day. These days I rarely get sick and I have a lot of energy. Hmmmm. Good question. I am still trying to figure this one out as I know downtime is so important for health. One thing I try to do when recharging is to disconnect from social media. I also strive for more quiet time. I do enjoy getting massages but the best way for me to reboot is being with my family and hanging out with my kids. They make my heart sing. What is your fitness philosophy? Has it changed since you are 40 or is it the same? You shouldn’t exercise just for the way you look but for your HEALTH and LONGEVITY. I never believed that in my early 20s but now that I am over 40 I see how important it is to exercise, stretch and to eat healthy. The older you get the harder it is to get in shape and do you lose muscle mass with age. You owe it to your family and yourself to stay healthy. And of course do what makes YOU happy! When it comes to working out, I truly believe it is important to do something you really enjoy. If you absolutely hate running, don’t try to force yourself to do it. There are many different workout options for getting in shape. A little off subject, but I have the hardest time finding workout clothes. You always have the cutest ones! Where do you buy your workout clothes? I love shopping for my workout clothes at Carbon 38, Vimmia, Athleta and Mira Rae. Any advice you can give someone who is turning or is over 40? Life is short, just do it and stop procrastinating! Looking to Get In Shape at Home? Check Out Tracey Mallett’s Most Recent Workout DVD’s, Svelte U 1 & Svelte U 2! I’ve done Tracey’s workouts in the past and really liked them. I would like to get back into exercising again and think this would be great!